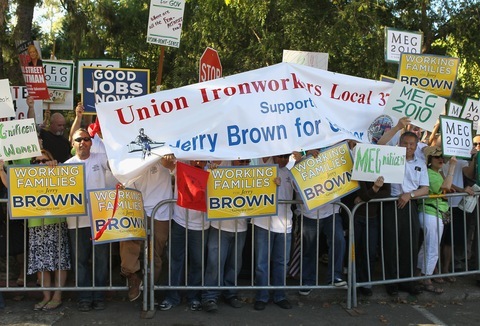 Supporters of California gubernatorial candidates Jerry Brown and Meg Whitman. Photo by Justin Sullivan/Getty Images. After Tuesday, California gubernatorial candidates Jerry Brown and Meg Whitman shouldn’t wait by the phone for an endorsement from the man they are trying to succeed, Arnold Schwarzenegger. Both candidates spent the day trying to convince voters that the other would be more like the current governor, whose approval rating has dipped to a near record low of 23 percent. Brown, the Democratic state attorney general and former governor, unveiled a minute-long television ad that pulls snippets of sound from Schwarzenegger and Whitman making sometimes identical statements about leadership, background and governing strategy. With so many close races in states with a high concentration of Latino voters, it’s no surprise to see the battle for this crucial bloc in full swing. “About 6.5 million Hispanic voters will likely cast their ballots this year, according to the National Association of Latino Elected and Appointed Officials — nearly 1 million more than in the last midterm elections in 2006. The group derived its estimate by looking at the increase in Hispanic voter turnout in the past three congressional elections,” reports Sandhya Somashekhar of the Washington Post. That estimate is clearly not lost on either party. “Latinos for Reform,” a Republican friendly group, produced an ad to run in Nevada urging Latino voters to stay home and not vote this year. The Spanish-language TV network Univision has pulled the ad from rotation and will not run it. Per the Wall Street Journal’s Laura Meckler, President Obama denounced the ad in a roundtable with reporters Tuesday. “I think it is terrible. . . It is a cynical political ploy to try to drive Latino votes to benefit a Republican candidate in Nevada who would never vote for immigration reform,” the president said. Next door in the Golden State, the California arm of the Service Employees International Union, which appears to believe Latino voters can make the difference in the highest profile gubernatorial contest in the nation, continues its attempt to get Latinos to the polls on behalf of Democrat Jerry Brown with a new Spanish-language ad painting Republican Meg Whitman as no friend of the Latino community. President Obama dismissed suggestions that he might consider replacing Vice President Joe Biden with Secretary of State Hillary Clinton on the 2012 Democratic ticket. “Completely unfounded. Completely unfounded,” President Obama told the National Journal’s Ron Fournier and Ronald Brownstein in an Oval Office interview to be published in full Monday. There’s been a lot of talk on the campaign trail about cutting deficits and budgets in the United States. But if you want to see the real thing, look east young man/woman. Wednesday afternoon in London, George Osborne, the Chancellor of the Exchequer (treasury secretary), will announce the biggest cutback in Britain’s public sector since the end of World War II. The aim of the Conservative-Liberal coalition government is to reduce the highest deficit in British peace-time history. Some of the 83 billion pounds in cuts already have been announced or telegraphed, and they whack at programs popular there or that would be considered nearly untouchable here, such as an 8-percent slice out of defense over four years announced Tuesday. Others would include ending child payments to middle and upper income earners and in effect raising the costs to parents or students for what is now largely subsidized college tuition. Some government agencies and programs, such as support for the arts, could be facing cuts as big as 25 percent. But one thing the Conservatives promised not to touch was the popular National Health Service, the government run medical care program established by Britain’s first post-war socialist government. And, catch this: The spending cuts will be coupled with up to 30 billion pounds in tax increases, a 2.5-percent boost in the Value Added Tax (VAT) a national and European sales tax, and possible increases in inheritance and payroll taxes. None of these would draw applause at Republican campaign rallies (or at too many Democratic rallies for that matter) in the United States, and show the divide that exists between the American and British versions of fiscal conservatism.